Gifting is one of my favorite things, and when it comes to finding gifts for my husband, I love it even more, even though he can be a little hard to buy for sometimes since he has pretty much everything and always insists he doesn't want anything. But I can't have a tree empty of gifts on Christmas morning, so I always scour the internets for the perfect gifts for him and sometimes come up with some gems like these! 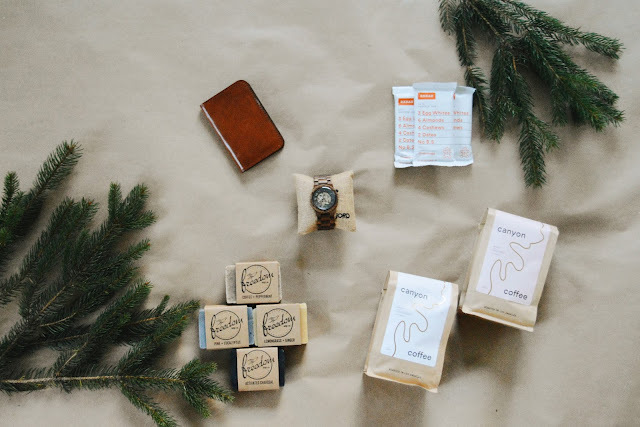 The perfect gifts for my husband and if you're in the same situation as me, (with a husband who never wants anything) here's a list below of some of my favorite gifts that are perfect for any guy! 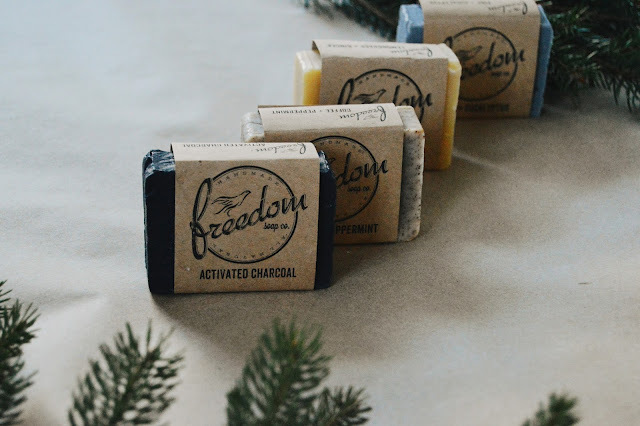 ONE | THE FREEDOM SOAP CO.
My husband absolutely loves handmade soaps, so these soaps from The Fredom Soap Co. were totally a no brainer. They smell great, wash great and are filled with great ingredients! 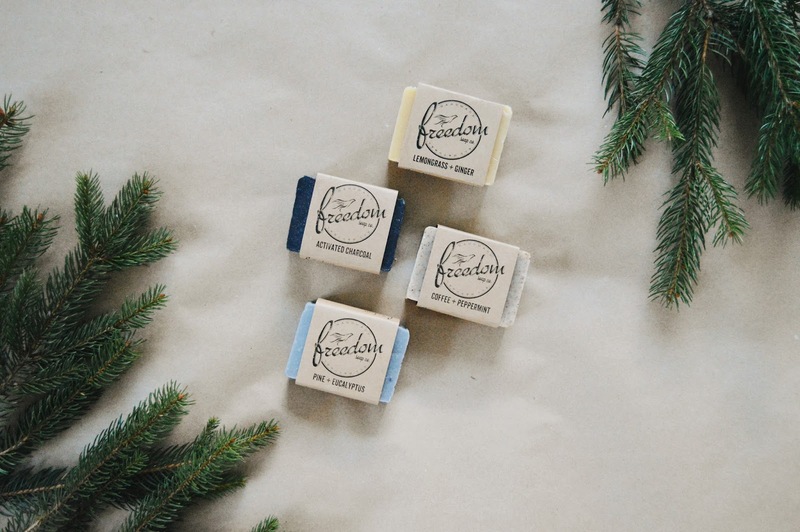 The Freedom Soap Co. is an all natural, soap and skin care company who specializes in small batch, handmade items perfect for all skin and everyone, and each product is specially formulated, tested and made completely by hand, right here in the United States! Another reason I love this company so much is because they source so many of their ingredients locally to them, so while you think you're supporting only one small shop, in reality you are supporting many more small shops and local business owners, beekeepers, farmers, brewers and more! Plus in addition to all that, their products contain none of the junk that you find in most products available on the shelves in stores, in Freedom Soap Company products, you'll find only the best, most natural and quality ingredients. 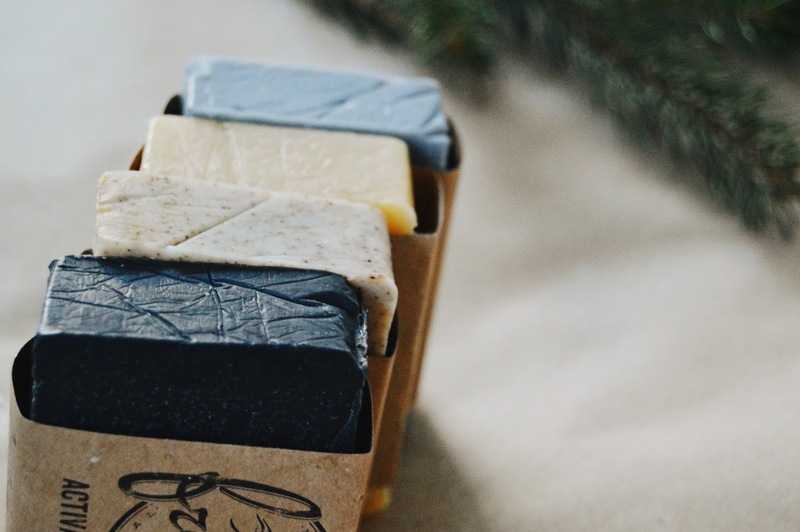 A few of our favorite soaps are the coffee and peppermint, activated charcoal, and pine and eucalyptus bar soaps, they all smell so amazing and I have a feeling they're going to make the most perfect stocking stuffers this year! Watches are one of the most timeless gifts for a man that I can think of. Something that they can feeling stylish while wearing, yet it's so functional and practical as well, and just makes for the best gift. This year I'm adding another watch, this absolutely stunning watch from JORD, to Frank's collection and I absolutely cannot wait for him to find this under the tree and start wearing it, in fact, I may have to give it to him a little bit early, I'm that excited about it haha. 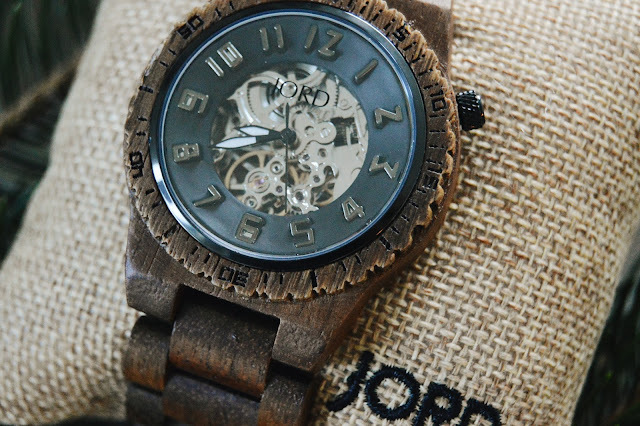 This Koa and Black Wood Watch (from JORD's Dover Series) is without a doubt the prettiest watch I've ever seen and also one of the most unique watches as well. The fact that it's made from wood is amazing, especially since I'm obsessed with all things natural wood, and the shiny gears peaking through? That just puts the candles on the cake. 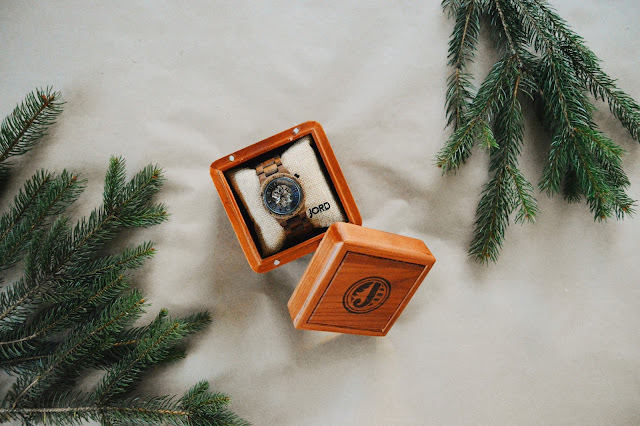 It features sapphire crystal glass, a display with hours, minutes and seconds, and the splash-proof koa wood band is pre-treated with tung oils to keep it looking great for years to come. It's also an automatic watch (or self winding), which means no batteries (so no trips to the jeweler for a new battery. Yay!). The rustic look of the wood, and the industrial vibe of the visible gears, give this skeleton wood watch such a classy, unique and masculine feel, the perfect gift for my husband. 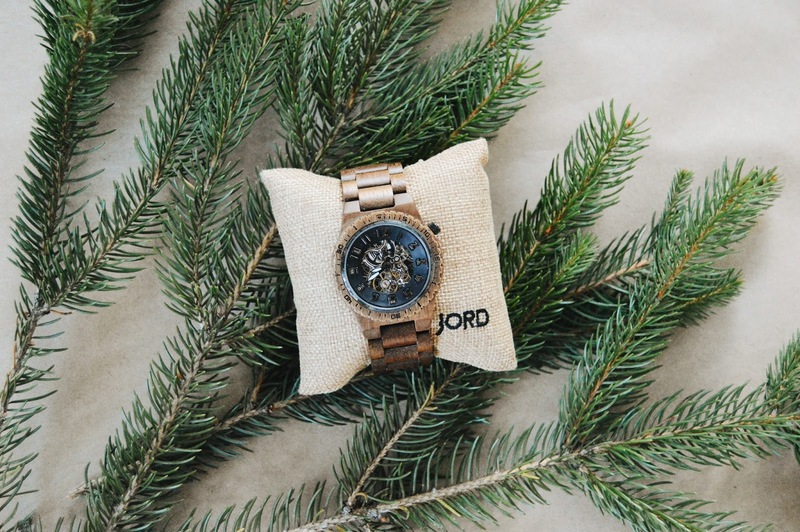 Every man needs a nice watch, so if you're looking to make a stylish statement this Christmas, make sure to scoop up one of these awesome wood watches from JORD, they have so many different styles and options to choose from and also sell women's watches as well all men's! We first tried RXBars last year and we're totally hooked now. 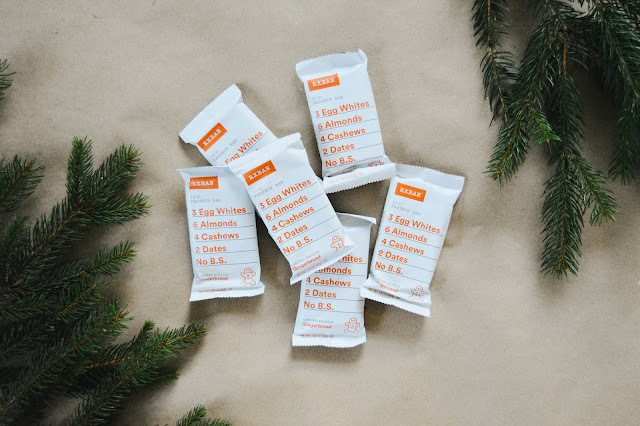 We've loved every flavor we've tried so far and I was super excited when a box of their NEW (seasonal) flavor showed up at our doorstep recently. Cue all the excitement when I realized the flavor was gingerbread. So delicious and the perfect holiday flavor. We love the great taste of RXBars, but one of the most important factors is that's inside them. 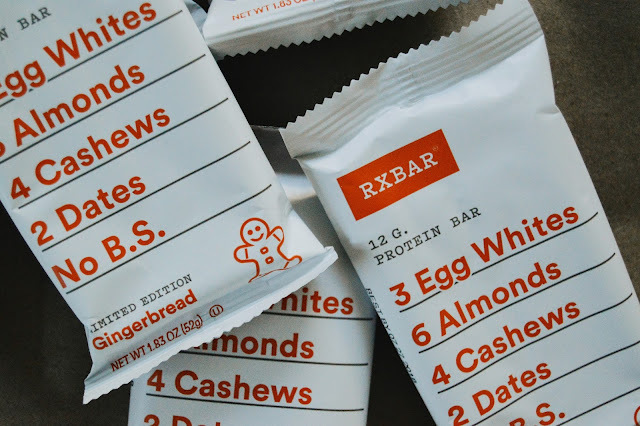 Just the good stuff: egg whites, dates, almonds, cashews... just real and good ingredients you can pronounce, packed full of protein and fiber, they're the perfect for whenever you get a snack craving and want a healthier option or for fueling up after a workout. They're also pretty perfect for filling up stockings for Christmas. 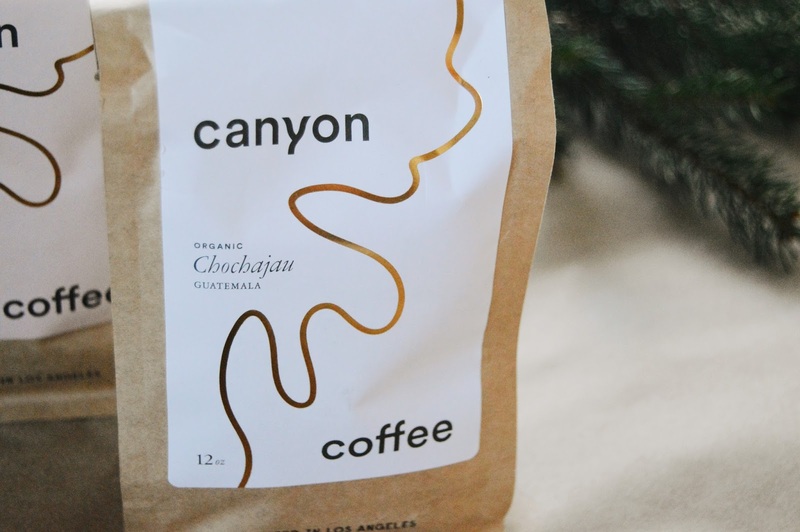 Coffee is one of my favorite gifts for my husband, because let's face it, you can never go wrong with coffee, especially when it's a hand crafted artisan roast made right here in the USA, plus I'm a sucker for great branding and packaging and Canyon Coffee's packaging is on point. 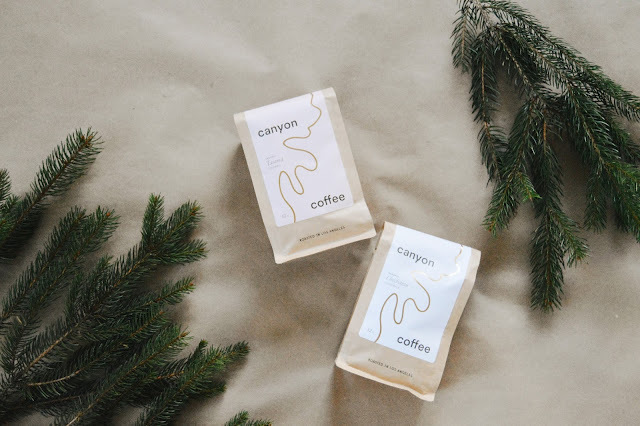 When I opened the box, the smell of delicious roasted coffee beans wafted out at me and I can only imagine that it will taste even better than it smells. My husband starts every single morning off with a hot mug of coffee, so not only is coffee the perfect way way to wake him up in the mornings, it's also a great reminder that I love him! 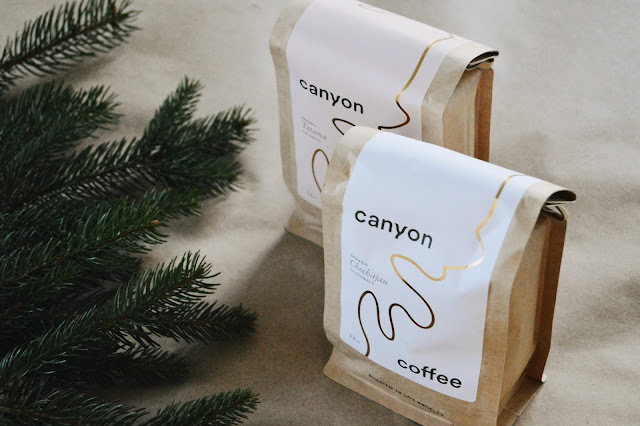 If you want to make this gift of coffee even better, sign up for the subscription service (you can choose to have your coffee shipped every 2 weeks or every 4 weeks, depending on what your coffee needs/wants are), truly the gift that keeps on giving (plus you save 10% off of the one time purchase list price by subscribing)! FIVE | STOCK & BARREL CO.
Wallets are another favorite item to gift to my husband, and this No. 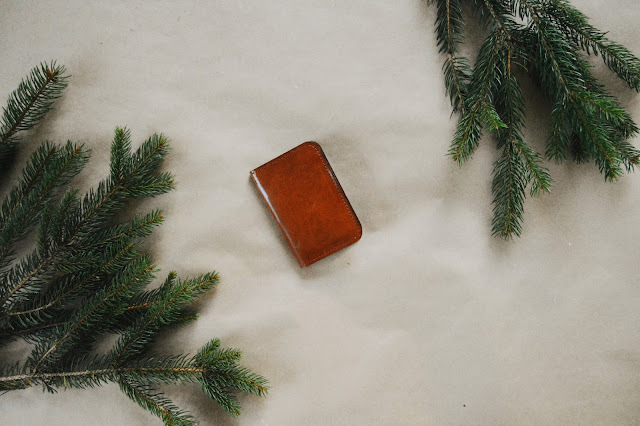 52 Buck Brown Vertical Leather Wallet from Stock & Barrel Co. is such a fun and unique take on a wallet that I know he's going to love. 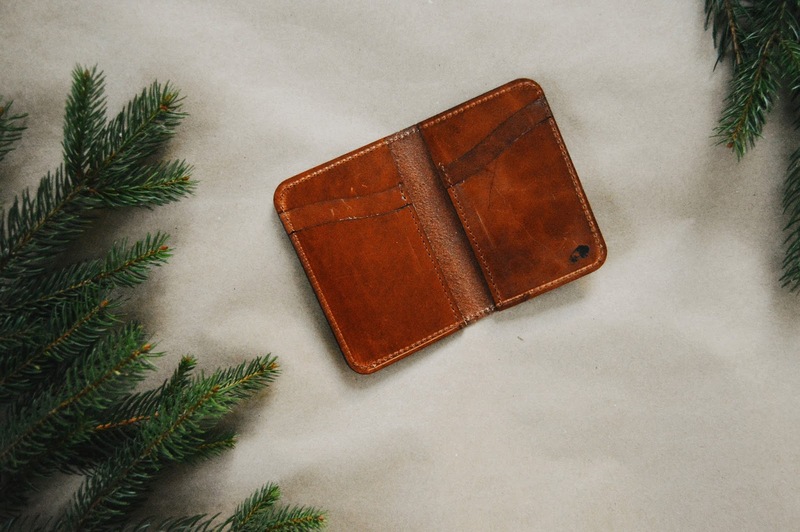 Crafted from high quality vegetable tanned harness leather, this awesome wallet will only get better with age as it ages with a lovely patina and gets softer day by day. 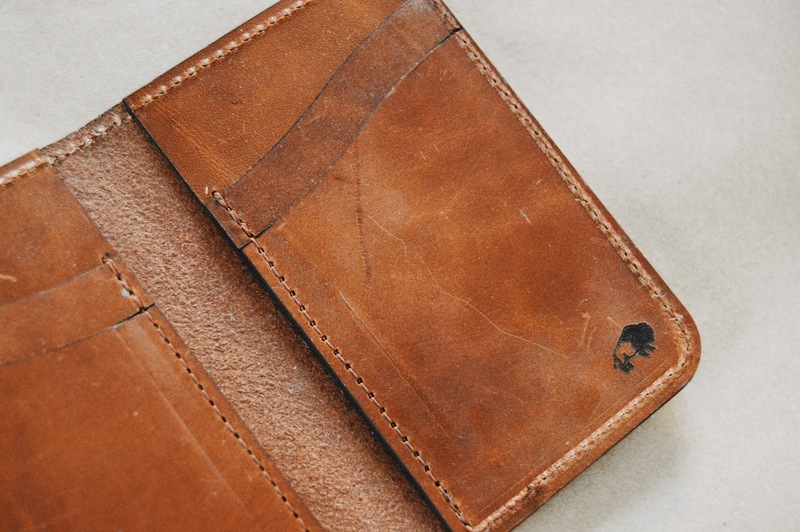 It contains 4 card slots, 2 hidden pockets and the edges of this wallet are neatly burnished and have the signature bison mark that Stock & Barrel is known for. 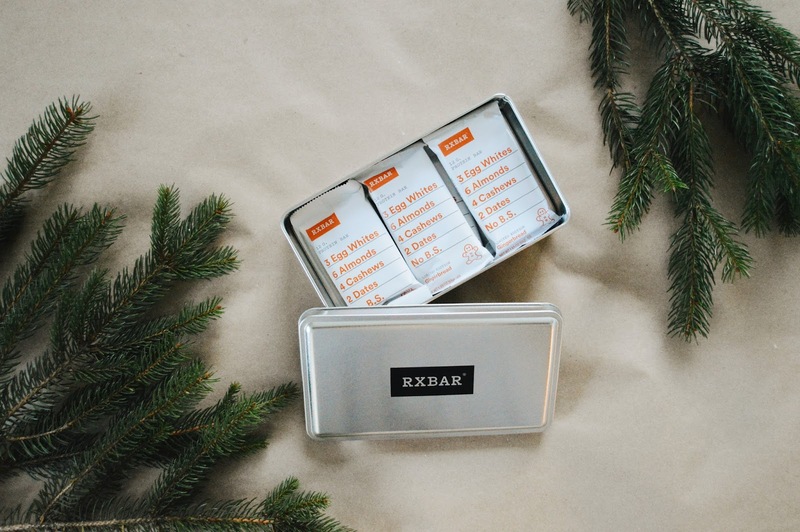 It's perfect for gifting or keeping for yourself. Stock & Barrel also offers a DIY kit so if this wallet strikes your fancy but you're like "oh! how cool would it be to make this myself", well now you can, find that fun DIY kit (which also make a great gift idea) here and you can learn all about leather working and crafting your own items from leather!